It's been a little while since I posted here I admit, but I'm still alive, and still working on and off on the source project, albeit at a slower pace lately. As it stands my PC is prone to crashing a fair bit (the RAM is on its death bed) so it doesn't lend itself well to extended mapping session or resource hungry tasks. After next week I've got a couple of weeks off work so thought I'd try something a little different, still trek related though obviously. 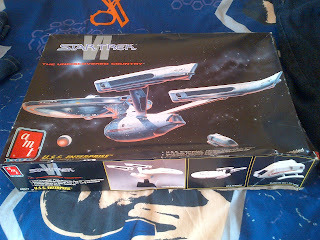 Many years ago I gave my uncle a boxed kit of the ERTL refit enterprise A, which he was going to build and light for me. Alas he never got round to it and its sat in his loft for years. I decided a while back that I'd have a shot at building it as I'm much older and wiser. So after he'd dug it out (almost literally), I went over and picked it up. Despite it being in a UDC box I know for a fact its a Star Trek V model, i think over the years its just been migrated to different boxes. Having said that so far as I'm aware the models are identical. Firstly I plan to clean the whole model pretty thoroughly, its covered in dirt, bits of glue, old paint, and a yellow patina at the moment so that needs sorting. Then its on to filling all those lines, which is going to be a big job, but should be worth it. There's also some damage to the secondary hull sections where glue has melted the plastic so ill need to fill those putty and sand them back down, although I don't see this being too difficult. Not sure why the botanical gardens windows were pulled out, I'll have to rebuild the frames i guess.